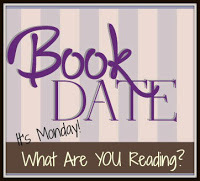 Book By Book: It's Monday 2/4! What Are You Reading? I'm writing this Monday evening because I have just lost another whole day to computer problems - this is getting frustrating! How do you like this Catch-22? My laptop couldn't connect to our WiFi (suddenly and randomly since I got it for Christmas) and none of the tricks I'd learned from Apple Help or the Genius Bar were helping today. It seemed the only way to fix the problem was to upgrade my system...but to do that, I had to be connected to the internet. See how that works? So, I am in a coffee shop (I could connect to their WiFi) and my system upgrade is finally finished. Now, I need to go back home and see if I can connect there - otherwise, it's back to the Genius Bar tonight (I really don't want to go out tonight!). ...Yay!! I am back at home - gratefully in the recliner with my feet up - and connected to our home WiFi! According to everything I've read, upgrading the system should do the trick. I cancelled my Genius Bar appointment. Not leaving the house again! So, that's kinda what my week was like. I actually got a lot of writing work done last week - I focused on getting ahead with my freelance assignments so I could finally make some progress on my book in February. I had a very productive week, but that put me behind with e-mails and blogs (sorry to those I didn't get to last week) and support groups...and then this connectivity problem got worse over the weekend, so I couldn't catch up. OK, deep breath. Soooo...here's what we've all been reading this past week! I finished reading True Enough by Stephen McCauley and enjoyed it very much. Last year, I read and loved his latest novel, My Ex-Life, and also got to interview him for Shelf Awareness and then meet him in person at Booktopia. He has a real talent for writing insightful but humorous stories about real life. This novel is about a 40-year old wife, mother, and TV producer who is feeling dissatisfied with her life and a gay man who is feeling similarly unsettled and is working with her on a project. Next, I picked up my next review book for Shelf Awareness, Before She Knew Him by Peter Swanson, coincidentally another Booktopia author from last year! I read and enjoyed his thriller, All the Beautiful Lies, last year for the annual event. This one is also a thriller, about a woman who discovers she's living next door to a murderer. The problem is that no one believes her because she has a history of mental illness that once included paranoia and false suspicions. The real suspense comes from the fact that he knows that she knows! I'm right at the end - will finish it tonight - and it's been a real page-turner. In between, I read a graphic novel, Deogratias: A Tale of Rwanda by J.P. Stassen. It's about the Tutsi genocide in Rwanda, from the perspective of a teen boy who is caught in the middle of it. He is Hutu, but some of his closest friends and neighbors are Tutsi. It is a dark, harrowing story. I certainly learned a lot, and it's an excellent graphic novel, in terms of conveying the story through the text and pictures, but it was brutal and difficult to read. It made me realize how little I know of this part of recent history and made me want to read An Ordinary Man by Paul Rusesabagina (the autobiography that the movie Hotel Rwanda was based on) - it was in my stack for Nonfiction November, but I didn't get to it. Yes, I finally finished listening to All the Crooked Saints by Maggie Stiefvater, a favorite author of mine, on audio. Someone on Facebook described it as surreal, and that says it all. I'm not even sure how to describe it! It's about a Mexican-American family who live in the Colorado desert in 1962 and can perform miracles. Pilgrims visit them in search of miracles, but there are very odd side effects. I'm not a huge fan of magical realism, and this is definitely that, but Stiefvater's writing talents kept me listening, and - as always with her novels - I ended up invested in the characters and wanting to find out what happened. My next audio book is The Blinds by Adam Sternbergh, though I just discovered that it didn't download to my iPod like it should have (more symptoms of the same computer problems, I think). According to the blurb, it's a dark twist on witness protection, where an isolated town in Texas is entirely populated by both criminals and those who've witnessed crimes, all of whom have had their memories wiped. I'm intrigued! Will have to try the download again and start it tomorrow. My husband, Ken, is reading a paperback I gave him for Christmas: Edge by Jeffrey Deaver. Though we both love Deaver's Lincoln Rhymes series, this is a stand-alone novel, so we were intrigued by it. He did take it on his Europe trip but didn't read much and was exhausted when he tried to read, so he started over at the beginning last Saturday...and only managed a few pages each night this week before falling asleep (often with the book still in his hand!). It's a long book, so it could take a while at this rate. Our son, Jamie, 24, is now reading the FINAL book 14 of The Wheel of Time series, A Memory of Light by Robert Jordan and Brandon Sanderson. I was wrong when I said he finished the series with book 13 - there is one more, weighing in at a hefty 1168 pages! He loves this series and has been looking forward to the conclusion. He says this last book is action-packed right from the first chapters, and he's loving it. Fiction Review: The Rent Collector by Camron Wright - fictional story about a real-life family in Cambodia that my book group loved! Just the two of us for our Superbowl "party" - leftovers tonight! Hope the computer issues are fixed soon for you! Thanks, Kellee! Lost e-mail for a bit today and panicked but it was our provider's fault, not my computer - whew! Ugh over computer problems. I'm so sorry you're going through this, but I'm impressed that you still got your post published on time. WOW! Also, I just HAD to flip over to your review of The Rookie because we LOVE that show. I agree with everything you said about it. We watch it on "basic" Hulu, so that's another option for viewers who can't afford to buy each episode. Our two weekly shows are The Rookie and This Is Us. Thanks for sharing these titles, Sue, and I hope you have a better week on the computer front! I think that is SO great, Shaye - we always watched TV with our sons, too - it's a great way to spend family time together. I don't like the new trend of everyone watching their own show on their own device! lol We see our TV time as time to spend together :) And I really LOVE that your show with the younger kids is Little House on the Prairie! OMG, my childhood favorite! My younger son also got totally hooked on another old fave of mine - The Hardy Boys/Nancy Drew show from the 70's (maybe into the early 80's) - we got it on DVD (I reviewed it for FamilyFun magazine), and my son must have watched every episode about 20 times! And thanks for the tip on Everwood! I hadn't heard of that one yet. Yay for getting your computer to work! I read Deogratis a few years ago. You might like the Netflix series "Black Earth Rising," which I just watched this past weekend. It's only 8 episodes and takes place now, but deals with prosecuting Rwandan perpetrators at the Hague. Thanks for the recommendation, Helen! It's definitely a part of (recent) history that I think too few people know much about. Glad about the wifi, to hear your response to All The Crooked Saints & about the Rwanda graphic novel. I'm sure it wasn't easy, but still, good to know about that tragedy. Happy 'good tech' week! Me, too! Had some email problems today and panicked a bit, but it was our provider's issue not my computer's - whew! Ahh, I have a mixed relationship with magical realism. For me, it either really works, or it doesn't. I am interested to read All the Crooked Saints now. Maggie's Scorpio Races blew me away, and that one was magical realism. I am sorry your computer was being rude! Technology...sigh. I tend not to like magical realism, unless the author is great - and Maggie is! Scorpio Races was a bit brutal for my taste but an excellent story. Just had a look at your review for Here and Now and Then - you should give The Dream Daughter a try for the time travel as its an interesting premise too. I do hope those computer problems are now a thing of the past. I am an Apple lover but your saga has cautioned me. Yes, these are not typical problems with Apple products! Lots of the comments online from others with my problem said, "This is what I'd expect from Windows, not Apple!" What bugged me is that the help line wouldn't admit it was a glitch in that particular operating system, even though it was all over the internet! Anyway, it seems that the latest OS (mojave) works well. The Brandon Sanderson novels are chunksters - so I definitely admire anyone who can get through them! :) Have a great reading week. My son's attitude is that a book isn't worth reading unless it is over 400 pages, at least! He routinely plows through 1000-page books - and thinks my Big Book Summer Challenge is hilarious!